(Nanowerk News) Blazars are among the largest and most energetic objects in the universe. Jets of matter ("jets") shoot from the cores of these active galaxies shoot, which are accompanied by huge bursts of gamma rays. An international team led by Lars Fuhrmann from Bonn's Max Planck Institute for Radio Astronomy has now for the first time confirmed a link between the gamma bursts and their counterparts in several radio frequencies ("Detection of significant cm to sub-mm band radio and gamma-ray correlated variability in Fermi bright blazars"). Furthermore, the researchers solved the mystery of the origin of the outbreaks: These come from the immediate vicinity of the supermassive black holes at the centre of blazars. Special types of distant active galaxies and their innermost central regions show extreme physical processes. 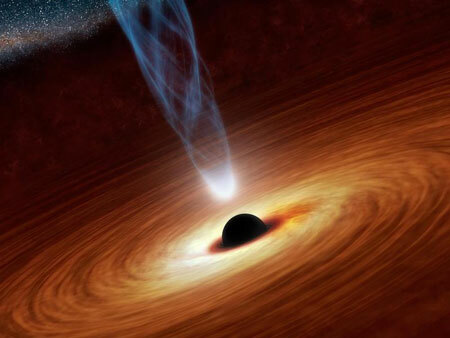 In the vicinity of a spinning supermassive black hole (billions of times heavier than our Sun) an enormous amount of energy is released, often in the most energetic form of light: high energy gamma-ray photons at mega- or even gigaelectronvolt (MeV/GeV) energies. This energy output is produced by feeding the black hole from surrounding stars, gas and dust. Matter is spiraling in onto the black hole and strong magnetic fields channel some of the infalling gas into two powerful, well collimated “jets” of plasma accelerating away from the center with velocities approaching the speed of light. Many of the connected physical processes are not understood in detail so far, for example the production of high-energy gamma-ray photons and their place of origin inside the jet, or the origin of strong outbursts of emission across the whole electromagnetic spectrum. New instruments and observing programs covering a large fraction of the whole energy spectrum nearly simultaneously allow new insights into the extreme physics of these objects to be obtained. Using a combination of three of the world’s most advanced single-dish radio observatories, namely the Effelsberg 100-m, IRAM 30-m and APEX 12-m telescopes covering quasi-simultaneously 11 radio frequency bands (the so-called Fermi-GST AGN Multi-frequency Monitoring Alliance, F-GAMMA programme), the team of scientists was able to monitor the frequently occurring radio outbursts of about 60 powerful active galaxies over many years. In addition to radio data within the F-GAMMA programme, the research team used gamma-ray observations of NASA’s Fermi Gamma-ray Space Telescope (launched in 2008), and a new statistical method to add up many radio and gamma-ray events. “It was illuminating to see the statistical noise going down and the average correlation popping up” explains Stefan Larsson, from Stockholm University. “This finally demonstrates that a significant connection exists, even when using different radio frequencies” he continues. The study furthermore shows that the radio outbursts arrived at the telescopes later in time than their gamma-ray counterparts, with mean delays between 6 and 7 days. Using the measured time delays the team was finally able to estimate distances of a few ten light years or less between the radio and gamma-ray outburst regions. “Based on our delay measurements we could estimate for one of the brightest gamma-ray emitting active galaxies in the sky, 3C 454.3, how far away from the supermassive black hole most of the gamma-ray photons must have been produced. We are talking about only a few light year distances – very close to the footpoint of the jet and the black hole itself!” proudly reports Lars Fuhrmann from MPIfR, the lead author of the paper. “This has serious implications for the physical processes producing the gamma-ray photons!” he adds. In the meantime the team is continuing to use the “Joint Eye” on the universe to collect more data and more events for detailed follow-up studies.